JYHYEU Wooden Hair Brush works great on all hair types and ideal for hair styling, blow-drying, and untangling. The ball tipped wooden bristle gently massages the scalp to relief stress and promote relaxation after a hectic day while the rubber cushion pad follows the contours of the head for efficient brushing. The brush enables healthy blood circulation to promote hair growth and prevent hair loss. The brush paddle and bristles are made of natural wood for years of durable use. The smooth handle design fits comfortably in any hands. Special Brush with nature fragrant smell as its handle is made from natural wooden bamboo. The brush provides subtle and relaxing scalp massage to relieve stress, increases blood circulations, and promotes healthy hair growth, while the rubber cushioned pad gently follows the contours of the head. 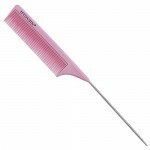 The Hair Brush is ideal for all hair types including straight and curly hairs. It is perfect for hair styling, untangling, and blow-drying.